Autumn and Winter. – Dirty wet dog , boats and sailing. My autumn and winter sailing season started with a quick day out down to Exmouth to dry WABI”’ out on the sand and give her an end of summer scrub. I thought that from the appearance of the bank that it would be hard sand but when i first stepped down cautiously onto it that it was surprisingly soft. A funny thing then happened : i was happily scrubbing away working in shorts and welly-boots with the waterline fairly close to my boot-tops. The combination of soft sand and the wake from a passing mobo then pushed the wave over the critical boot limit and both wellies filled instantly. What i did then was what i should have done from the beginning and just worked in bare feet in the surprisingly warm estuary water. The day was in enormous contrast to our first day in the Exe when we came in over the bar amid heavy rain and wind squalls. Today it was comfortable working in just shorts and a tee-shirt and pleasant splashing around in the shallow water. I am always reminded that sea temperatures are at their highest now and then coldest just as the sailing season normally starts again in the spring. The only other boat that came out to play was this this little red gaffer which i think is a ‘Cape Henry’ , one of Dudley Dix’s excellent small boat designs. From a quick look around the moorings on the same day there seems to be 2 of these boats on the river : a great boat for the estuary i feel. While i am preparing for my autumn and early winter sailing it is full speed ahead at the yard and further up the river as boats arrive alongside to have their rigs pulled and are craned ashore. The yard has now taken over the car park on the quay which becomes a boat storage area for the winter. To me it seems far too early to stop sailing especially on days like this first one when its still warm to work and sail in shorts. The end of the first day when i anchored over the ‘greenland’ mud just across the water from Lympstone gave me a spectacular sunset as i settled in for the night. The pictures aren’t modified in any way : that is actually what the light did over about 20 minutes ! With the emphasis on day-sails and overnighters on the boat rather than multi-day sailing i am starting to take stuff off the boat again especially the longer term cruising stores. I have always kept the boat stocked and stored such that i have food , water and fuel for at least 10 days which, had things worked out differently, would have made me independent for a longer cruise. As i left the boat this time i had to go back into the inner berth again which means that she won’t float when i go down there next week. What that means is that i will concentrate on getting some jobs done so that i don’t have a long refit list during the winter. What i will do is probably stop sailing sometime around Christmas this year and then lay the boat up in its mud berth until next spring but i will go across there to air the boat out at least once a fortnight and spend a night aboard. I did think seriously about fitting a heater of some kind but the only one that i can find that i think would fit is the little propane one from the US, not only expensive to buy but even worse to import and pay the tax as well. I suspect that what i will do is put up with the cold just by taking some additional clothes and kit with me and use the stove budget for the thing that i really want on this boat ie a tillerpilot : i will be watching out for best deals at the chandleries this year. Cold morning starts on the river. 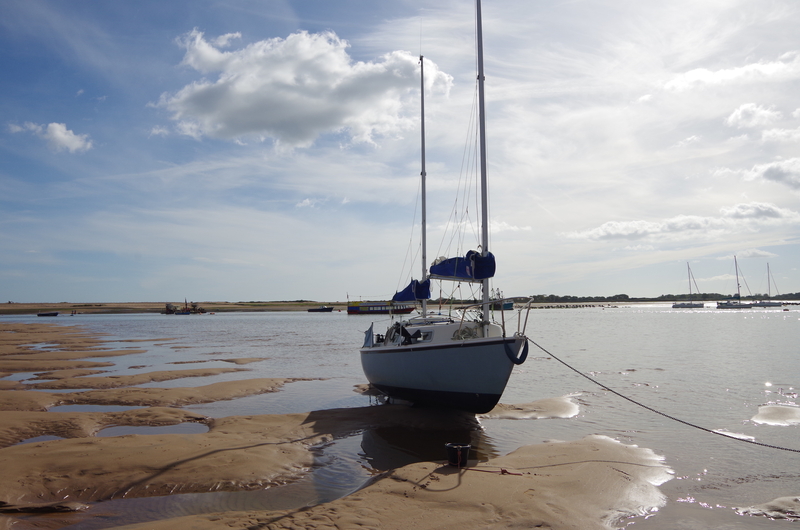 What we will do is both explore the estuary under sail and use the boat as a temporary base to go off exploring on foot and by car. I have had a quick look at the eastern side of the river for walking routes and there does seem to be a walking path from Exemouth down to Lympstone but is then effectively blocked off by the Commando training centre (CTC) I would love to include a bit of the history of the CTC because at some time i would like to do a historical post about the late ‘Blondie’ Hasler and operation Franckton. It does seem possible to walk right through to Exeter on the eastern bank of the river and then the whole of the western side looks walkable. What i would like to do having landed on the central sand bank inside the entrance is to beach the boat inside Dawlish Warren and go for an explore ashore there too. Lovely sunsets again Steve — great. And looking forward to the Frankton post. If you ever get out to Maldon in Essex, it’s well worth seeing the only surviving Cockle Mk II from the raid at the Combined Military Services Museum (it’s the one that got damaged on deployment from the submarine). Paddy Pantsdown’s book, “A Brilliant Little Operation” is worth a read too.